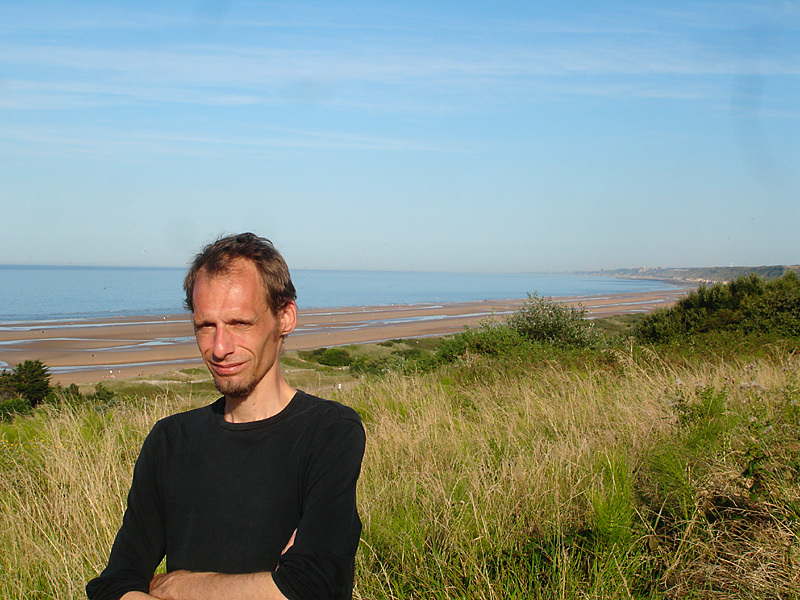 This is the second article in a series of reports from a trip to the D-Day landing beaches in Normandy and its surroundings that was made by the author in August 2009. The English Channel and its beaches lies right in front of me as I arrive at the beachfront at Saint-Laurent-sur-Mer by bus in the late afternoon. It’s a cloudy, warm day in late August. I take a few steps out on the sand and I’m literary standing on Omaha Beach, on the very same place where US soldiers landed on that eventful and bloody morning of the day that the historians call D-Day. Yet there is not much at first sight that reminds of the horrifying battles in which thousands of soldiers died. Over the coming days I will learn that there’s a memorial or war museum at every turn in this part of France but at the moment I’m staring at the few holidaymakers going about doing whatever it is holidaymakers do: windsurfing, swimming, sunbathing. But the holiday season seem to be more or less over here and the beach is quite empty. Then a huge metal sculpture in the middle of the beach catch my eye. It resembles a bunch of broad, pointed, sword blades or metal sails protruding from the sand several meters into the air. Anilore Banon’s monument Les Braves (The Braves) is not a traditional, monolithic war memorial and I have to step up to an information board close to it to assure myself that it has something to do with D-Day, which it indeed has. Banon’s sculpture group is not really a comfortable artpiece where it stands in the middle of the beach that I suspect would be crowded by sunbathers and tourists in the middle of the summer season. It somehow resembles an abstraction of mortar hits throwing sand high in the air among soaked and bleeding men who try to escape death by running from their landing vessels over the beach to an uncertain fate. Even if you could see the monument as a symbolic depiction of chaos and threat it’s not overly sorrowful. The light, matte, metal surface that reflects the sky and the ocean seems to communicate a feeling of hope and redemption, perhaps liberation. I believe that Banon manages to handle these conflicting emotions and contrasts very well. It’s quite obvious that contrasts can not be avoided here. This part of Normandy will for a long time function both as a resort for the holidaymakers, a place for remembrance of the killed soldiers and a destination for researchers and war-tourists as myself. Those who come here to remember their relatives or comrades may be hard to spot on the beach but I will meet them when I later visit the many cemeteries and memorials that are not directly on the beachfront. It’s on the other hand impossible for the sun-worshiping beach-dwellers to ignore the fact that this place is not the ordinary holiday paradise. Over the coming days I will come across numerous small memorials and bunkers and there are several museums aside the roads down to the beaches that are a must for any tourist or first-time holidaymaker here. 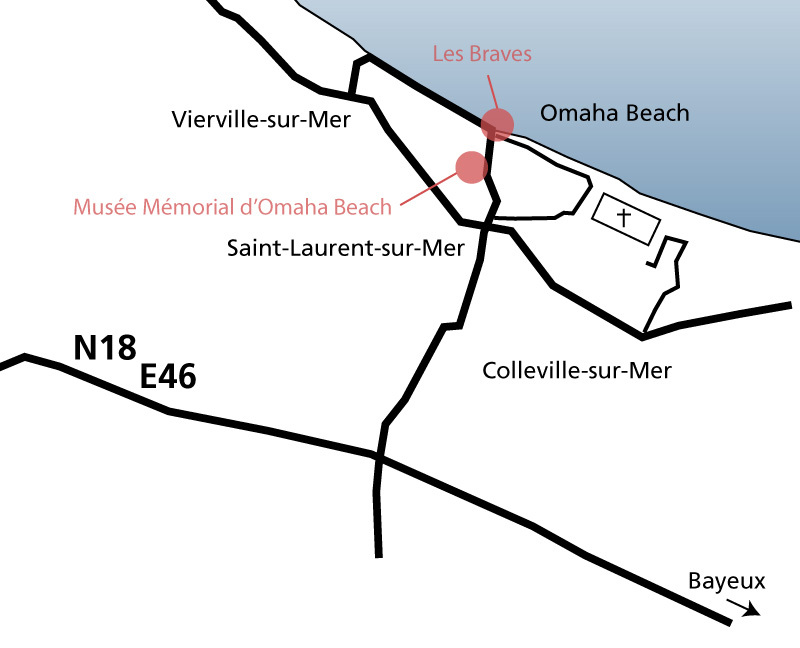 A good example is the Memorial Museum of Omaha Beach (Musée Mémorial d’Omaha Beach) which is located some 300 meters from the beachfront on the road to the village Saint-Laurent-sur-Mer. 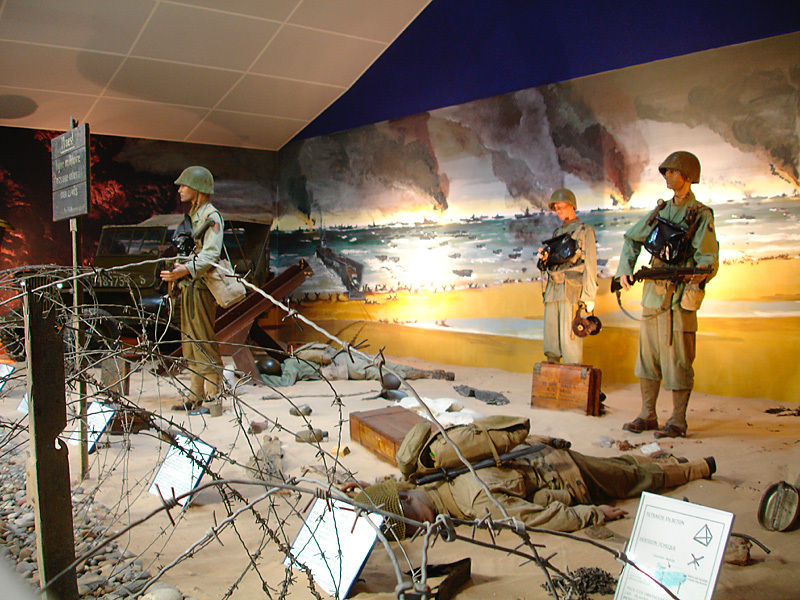 While this museum with its 1200 square meters may be somewhat bigger than most of the similar private museums that you stumble across in the vicinity of the landing beaches it’s quite typical for its kind. 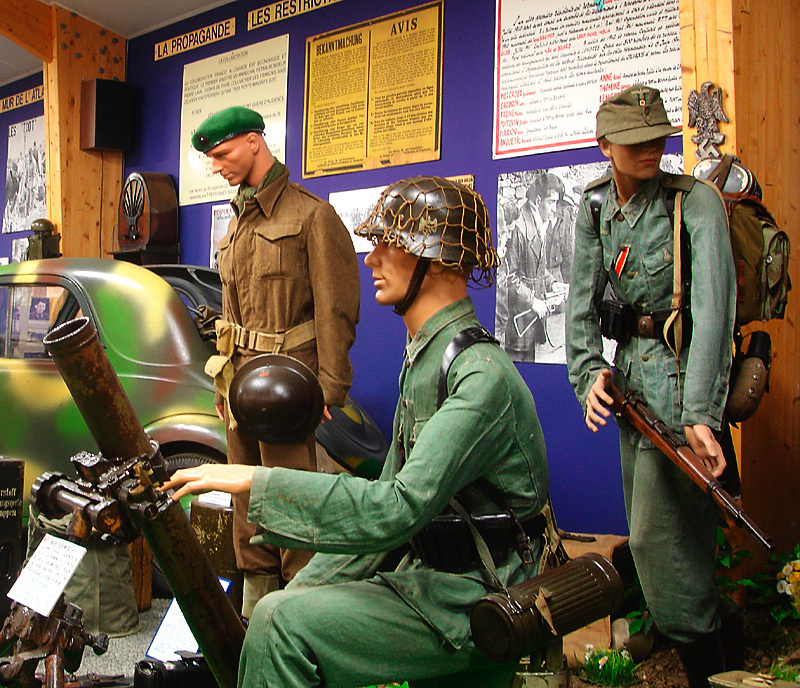 The museum showcases a large collection of weapons, vehicles, uniforms, weapons and other equipment and there are lot of maps, texts and signs that guide you through the story of the D-day landings. Even though the exhibition had its charming moments I found it to be a hotchpotch of equipment cramped into a too small building. 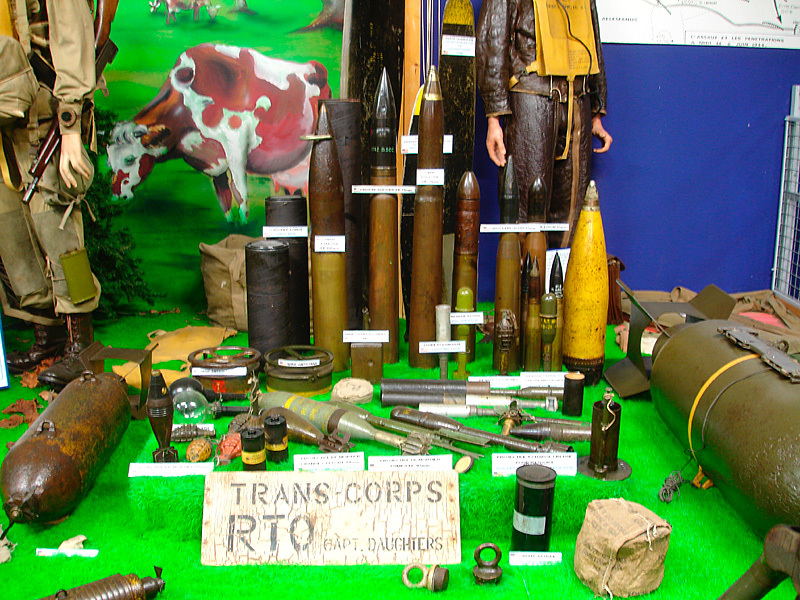 The information design was lacking in far too many ways, and by populating the dioramas with shop mannequins in uniform the exhibition failed for most parts to communicate any emotions. But you have to take these kind of museums for what they are (or at least, seem to be): small, private, slow-growing enterprises that took advantage of an abundance of abandoned vehicles, uniforms and weapons and tried to meet a huge demand from visiting tourists and holidaymakers who want to learn more about the events. And those visitors do seem to love it. During my hour-long stay the museum was full of people. And yes, I did buy a souvenir as well. 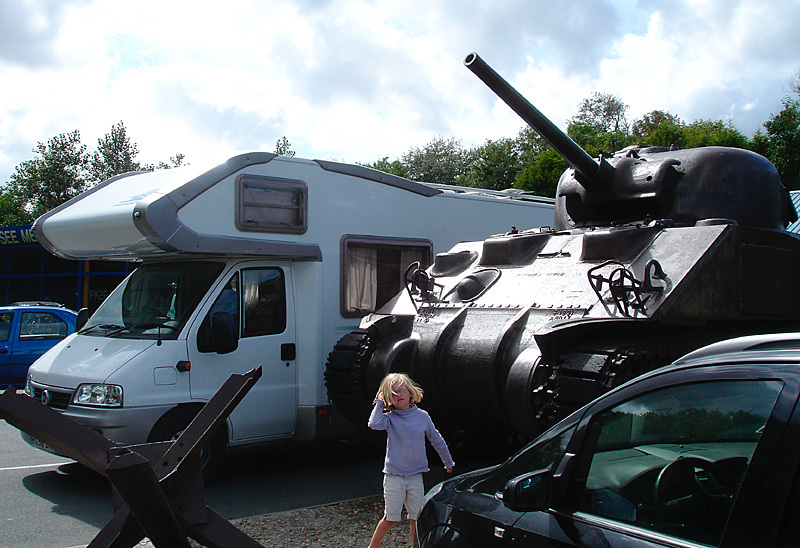 After the first day at the beachfront of Omaha Beach I must admit that I felt a bit confused. I had traveled to visit the scene of one of the major battles of World War II and now found myself in a holiday paradise - in a place where the traumatic and dramatic history of the past seemed to be intangibly intertwined with the leisure of the present. 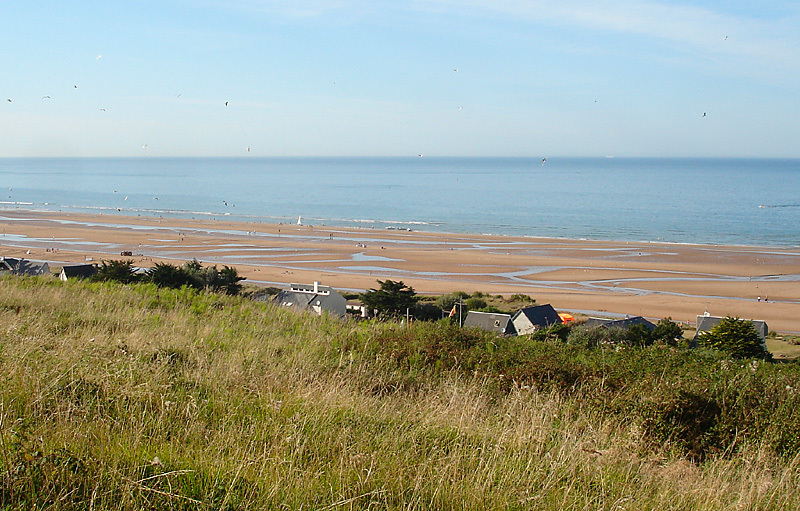 According to statistics presented by the French Ministry for Crafts, Trade, and Tourism (which is a part of the Ministry of Productive Recovery) more than 2,8 million hotel rooms were booked in Basse-Normandie (Lower Normandy) in 2012 and of them almost 580,000 were made by foreigners. I have not found any information how many of these bookings was with the aim to explore the landing beaches or other memorials or cemeteries relating to the invasion of Normandy. A series of articles that explores memorials, museums and cemeteries of Normandy. All photos by Jon Brunberg. All rights reserved.